There is some magic about fantasy stories that keep readers hooked on every word. Whether it’s stunning new worlds or intriguing characters with difficult quests ahead of them, these stories allow readers to escape from the mundane dealings of everyday life and delve into places where the extraordinary is possible. This week’s Up and Coming spotlights a story that brings all of that and more to the table. 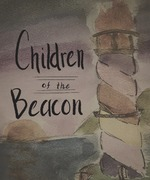 Children of the Beacon, written by new user Paper Moon introduces readers to an exciting new world where we see the island of Emanon through the eyes of several children, all of whom have been confined to the Tower of Pyre. Magic and mystery play at the forefront of this story, and despite only having three currently-published chapters, Children of the Beacon is already shaping up to be a fantastic story! I caught up with Paper Moon to ask them a few questions about this exciting new addition to Mibba. Tell us a little bit about Children of the Beacon. In short, Children of the Beacon focuses on this group of children who live in this tower on an island, Emanon, that has a history of conflict between their human inhabitants and those with magical powers, the Mystics. They are not allowed to leave the tower and all aside from one have no memory of life before coming there. However, when their caretaker disappears, they are forced to leave on a journey to recover their memories and powers, for it turns out that they are all children of Emanon's most powerful Mystics. On top of all of this, they also have to avoid the evil clutches of the Guild, a group of Mystics who wish to exploit the children's powers in their mission to wipe out all of the humans in Emanon. What was the inspiration behind Children of the Beacon? As a lover of mythology, folklore, and fantasy books, shows, and video games, a lot of my inspiration came from the idea of mixing all types of legends from all over the world while also adding my own sense of adventure! Originally the specific idea came to me when I was in high school a few years ago so I just spent a lot of time planning it out and writing random scenes, but now I'm ready to buckle down and actually write the story itself! My favorite thing about writing this story is fleshing out this world that I've created. I have a document on my computer that is basically a history/science textbook about Emanon, and I could just go wild writing on it for hours on end! Writing the different characters is also very fun because this is the first time I've written something that incorporates so many characters. Do you have a plan for Children of the Beacon, or are you going with the flow as you write? Yeah, I would say that I have a pretty solid plan, though I'll admit I find myself often reworking things as I go because they would fit better. Do you have any other stories that you think people might enjoy? I'm very new to Mibba, so I can't really recommend much on here! In terms of books not on the site, though, I really loved the A Song of Ice and Fire series! What is your favourite thing about Mibba? My favorite thing about Mibba is how well you can organize your stories and characters! Also, I feel like other writing platforms are more centered on fan-fiction and while Mibba does have a lot of that, there is a good amount of other stuff, too. What would you like to say to anybody who reads your stories? I just want to say that I appreciate everyone who reads my work! It really means a lot to me, and I just hope that they find enjoyment reading my stories! January 13th, 2019 at 11:41pm, nearly witches.